The ENMR-Plateau Middle Mile project intends to enhance broadband capabilities for critical community anchor institutions in eastern New Mexico and west Texas by lighting a more than 1,600-mile ring of fiber and constructing 74 miles of new fiber in five communities. The project plans to connect more than 200 anchor institutions – including educational institutions, public safety organizations, healthcare facilities, and government agencies – at speeds of up to 1 Gbps. In addition, the network intends to offer wholesale services and facilitate broadband expansion to an estimated 20 communities and an area with nearly 700,000 homes, over 36,000 businesses, and 263 anchor institutions. To provide much-needed broadband capacity to critical community facilities in underserved west Texas and eastern New Mexico communities, ENMR-Plateau plans to construct 189 miles of new fiber and utilize 418 miles of additional existing fiber to create a middle mile broadband network spanning central and eastern New Mexico and parts of western Texas. Expanding its $11.2M BTOP Round One infrastructure award, ENMR plans to deploy its network into additional underserved areas with 1 Gbps middle-mile speeds. The project proposes to facilitate distance learning and education for tens of thousands of residents by significantly improving broadband connections at schools and higher education institutions. ENMR-Plateau plans to partner with both New Mexico and Texas colleges and universities, regional utility companies, and other service providers as needed to further maximize use of fiber and broadband capacity. Navajo National Middle Mile/Last Mile Project proposes to bring high-speed affordable broadband services to the Navajo Nation by deploying 550 miles of new aerial fiber-optic cable and 59 new or modified microwave towers covering 15,000 square miles in Arizona, Utah, and New Mexico. The proposed service area has rugged terrain, significant poverty, and more than 60 percent of residents lack basic telephone service. The project expects to directly connect 49 Chapter Houses, which serve as community centers for the Navajo population, at speeds from 10 Mbps to 10 Gbps. Last mile wireless services will be offered at speeds between 1 and 3 Mbps through the project’s wireless partner, Commnet Wireless. along with the existing infrastructure, connect to a 100 Gbps backbone network at several key points statewide. 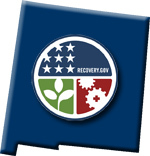 Second, SIRCITS proposes to utilize the microwave network’s towers to deploy a new interoperable 700 MHz public safety wireless broadband network in the Albuquerque and Santa Fe metro areas that would cover 220 square miles, 14 site locations, provide 1,500 first responder end users with speeds of up to 7.5 Mbps, and benefit a population of about 600,000 residents. Some goals of the new public safety network include streaming critical patient data from paramedics to hospital personnel; field access to records management systems for criminal, fingerprint, and mug shot information; building blueprints and infrastructure diagrams on the go to enable access for firemen; and video applications to improve situational awareness at incident command posts. With this project, the New Mexico Department of Information Technology (NMDOIT) will build on the framework created by the New Mexico Integrated Strategic Broadband Initiative in 2008. The funding will support reorganization and expansion of statewide broadband capacity building by developing subcommittees for the following areas: infrastructure, technical planning, applications, legislation, education, governance, tribal issues, and broadband providers. In addition, NMDOIT will hold public forums and an annual conference. With this funding, NMDOIT plans to catalogue all broadband and technology training programs located within the state and then identify areas that lack training resources in order to improve planning. NMDOIT will also provide direct technical assistance to tribes to facilitate their participation in the broadband mapping project and to improve their internal geographic information system capacity. Areas of rural north central New Mexico rely significantly on dial-up service, and much of the region lacks affordable, high-bandwidth network services for community anchor institutions and small businesses. The North Central New Mexico Economic Development District’s REDI Net project plans to deploy a middle-mile fiber optic broadband network across the counties of Rio Arriba, Los Alamos, and northern Santa Fe, and to five Native American tribal communities. The project proposes to enable distance learning and advanced technology applications at schools and community colleges, and promote energy efficiency by enabling “smart grid” applications for regional rural electric cooperatives. REDI Net plans to utilize the network to provide support for locally based businesses, especially in the technology, media, and renewable energy industries. The project also intends to offer higher levels of security and reliability for public safety and telemedicine in the region.